All leathers and skins provided by Wild Touch® is a natural product and not 2 pieces of leather and skins are identical. There will always be small differences in colours and patterns for each piece of skin and leather. This uniqueness is the true beauty of natural leathers and are NOT concidered to be a failure. High quality and eco friendly production with respect for human health and the environment. Over the last few years, tanning operators have become more and more aware of the environment and the importance of using eco-friendly materials. Today, Wild Touch´s® main supplier of high quality cow leather – Ansonia in Italy - have made it possible by the most up-to-date, cutting edge and eco-friendly technologies, to limit all the polluting agents. By this we offer a completely organic product that is easy to dispose of and recycle. All leather from Ausonia is vegetable tanned leather selected from some the finest hides available. This leather type is anilin leather. Aniline leather is a type of leather dyed exclusively with soluble dyes without covering the surface with a topcoat paint or insoluble pigments. The resulting product retains the hide's natural surface with the 'grain', i.e. visible pores, scars, wrinkles etc... of the complete original animal's skin structure. These natural imperfections make each hide genuine, authentic and unique. They are an asset in defining the personality, look, and feel of every leather piece. Vegetable tanned aniline leather will mature over time by changing colour = patina. We only sell legal game hides. The game hide is subject to CITES regulations (we always demand CITES certificate). Wild Touch® accept NO game skins on the CITES list if it not followed by enclosed documents. 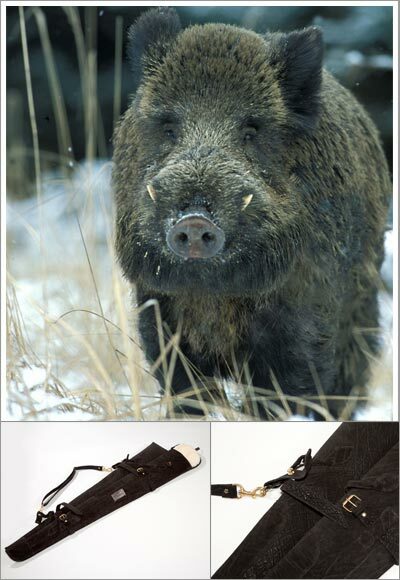 All products where we use game hide, will always be delivered with a proof of origin and authenticity (CITES document). Some of the game hides are tanned with chemicals like Chrome to get the softness in the leather. Vegetable tanning uses tannin (this is the origin of the name of the process). The tannins (a class of polyphenol astringent chemical) occur naturally in the bark and leaves of many plants. Tannins bind to the collagen proteins in the hide and coat them causing them to become less water-soluble, and more resistant to bacterial attack. The process also causes the hide to become more flexible. The primary barks, processed in Bark mills and used in modern times are chestnut, oak, redoul, tanoak, hemlock, quebracho, mangrove, wattle (acacia; see catechu), and myrobalan. Hides are stretched on frames and immersed for several weeks in vats of increasing concentrations of tannin. Vegetable tanned hide is flexible and used for many type leather goods. The leather manufacturing process is divided into three fundamental sub-processes: preparatory stages, tanning, and crusting. All true leathers will undergo these sub-processes. A further sub-process, surface coating, can be added into the leather process sequence, but not all leathers receive surface treatment. Since many types of leather exist, it is difficult to create a list of operations that all leathers must undergo. Tanning is the process which matches the protein of the raw hide or skin into a stable material which will not putrefy and is suitable for a wide variety of end applications. The principal difference between raw hides and tanned hides is that raw hides dry out to form a hard inflexible material that when re-wetted (or wetted back) putrefy, while tanned material dries out to a flexible form that does not become putrid when wetted back. Many different tanning methods and materials can be used; the choice is ultimately dependent on the end application of the leather. The most commonly used tanning material is chromium, which leaves the leather, once tanned, a pale blue color (due to the chromium); this product is commonly called "wet blue". The hides once they have finished pickling will typically be between pH 2.8 and 3.2. At this point, the hides would be loaded in a drum and immersed in a float containing the tanning liquor. The hides are allowed to soak (while the drum slowly rotates about its axle) and the tanning liquor slowly penetrates through the full substance of the hide. Regular checks will be made to see the penetration by cutting the cross-section of a hide and observing the degree of penetration. Once an even degree of penetration exists, the pH of the float is slowly raised in a process called basification. This basification process fixes the tanning material to the leather and the more tanning material fixed, the higher the hydrothermal stability and increased shrinkage temperature resistance of the leather. The pH of the leather when chrome tanned would typically finish somewhere between 3.8 and 4.2. Crusting is the process by which the hide/skin is thinned, retanned, and lubricated. Often a coloring operation is included in the crusting sub process. The chemicals added during crusting must be fixed in place. The culmination of the crusting sub process is the drying and softening operations. Crusting may include the following operations: wetting back, sammying, splitting, shaving, rechroming, neutralization, retanning, dyeing, fatliquoring, filling, stuffing, stripping, whitening, fixating, setting, drying, conditioning, milling, staking, and buffing. For some leathers, a surface coating is applied. Tanners refer to this as finishing. Finishing operations may include: oiling, brushing, padding, impregnation, buffing, spraying, roller coating, curtain coating, polishing, plating, embossing, ironing, ironing/combing (for hair-on), glazing, and tumbling.